Win a 1924 Morris Oxford or Cowley. Homepage. This page: A leaflet encouraging people to buy tickets in The Oxford Motor Ballot, circa 1924. Morris Oxford & Cowley competition. 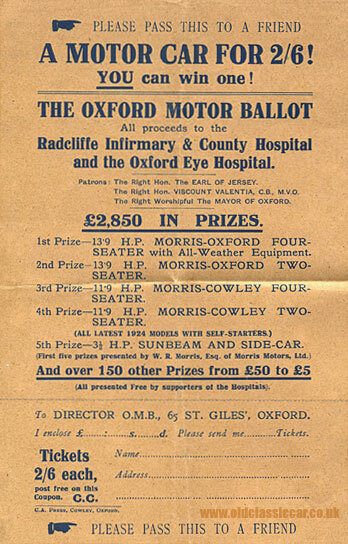 Tickets for The Oxford Motor Ballot cost 2/6, and entering gave the buyer chance to win one of 155+ prizes, the top four prizes being "bullnose" Morris motor-cars, all donated by William Morris Esq. of Morris Motors Limited, which of course was located in Oxford. He'd later become Lord Nuffield. Fifth prize was a motorcycle and sidecar combination. 1st - 13.9HP Morris Oxford Four-Seater with All-Weather Equipment. 2nd - 13.9HP Morris Oxford Two-Seater. 3rd - 11.9HP Morris Cowley Four-Seater. 4th - 11.9HP Morris Cowley Two-Seater. 5th - 3.5HP Sunbeam and Side-Car. It was noted that all the Morris cars were bang up-to-date, 1924 models, equipped with self-starters. Proceeds from this prize draw would go to the Radcliffe Infirmary & County Hospital and the Oxford Eye Hospital. In all, the prizes were worth some £2,850, a not-insignificant sum for the early 1920's. Whoever received this leaflet must have declined the offer of winning a new Morris Oxford or Cowley, as no entrant details have been entered. Hopefully more information on this Motor Ballot will turn up over time, this has certainly been the case with the Kensitas Win an Austin 12/6 draw from 1932, so hopefully the same will happen here. Who won the cars? Did they and their owners ever feature in the local press? More old motoring items like this are included in the Motoring Collectables section, here at oldclassiccar.